KARACHI: “Dhia Bheel was a beautiful young woman but always looked gloomy and frail. She couldn’t put up with hunger and domestic violence. She jumped into a well with her six-month-old child. I’ve witnessed two suicide cases in the last two months in my tiny village,” says Lado Meghwar, resident of village Meghi Jo Tar in Tharparkar. 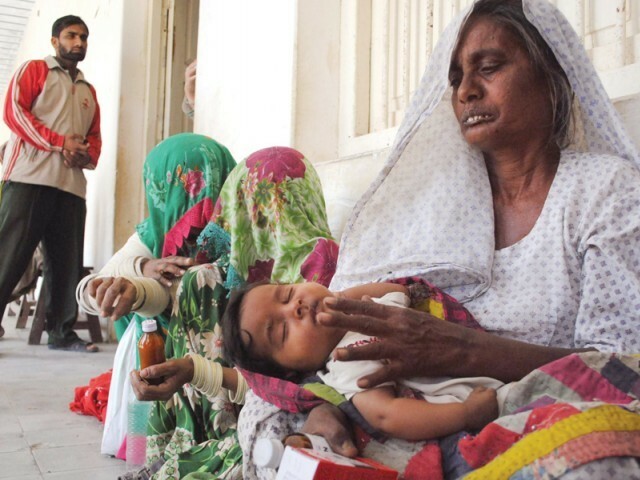 Dozens of children have reportedly died of malnutrition in this drought-stricken desert district of Sindh this year alone. And psychiatrists believe the persisting famine is creating psychological disorders among the Tharis, leading to suicidal tendencies. 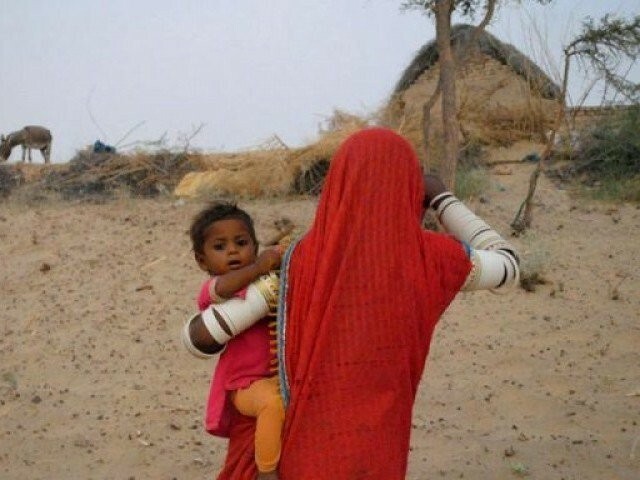 In the past 10 months, 40 people have committed suicide in Tharparkar, including two cases of mothers killing themselves along with their children, according to a report prepared by a local NGO, AWARE. More worrisome are the two cases of minors committing suicide. Thirteen-year-old shepherd Savaee Ghazi Meghwar of Kasbo village, district Nagarparkar, killed himself when his parents did not give him his pocket money. Psychiatrist Dr Lakesh Kumar Khatri confirms that suicide cases are on the rise in Tharparkar, and he links it mainly to depression. With the drought in Tharparkar prevailing for a third consecutive year, there is much to be depressed about. This affects women and children the most, according to Khatri. Seventy-five per cent of patients of mental illnesses here are females, he claims. Thari women are malnourished. Their average hemoglobin level is eight to 10, which means they are also anemic. And their problems keep multiplying. More and more Thari men are moving to cities to try and earn a living, leaving their women lonelier and sadder. Conversion Disorder, a mental illness in which psychological illness starts producing physical symptoms, is also common among Thari women. The realisation of their plight is equally painful. “While this awakening is a good thing, it is also painful, because the Thari people are realising how far behind they are,” says one doctor. The state, however, is in a state of denial. Dr Lekhraj, who works at the state-run hospital in Chachro, denies any of these deaths were due to suicide. MPA Mahesh Kumar endorses Dr Lekhraj: “Maybe the women slipped and fell” into the wells. That is because many blame the government for the depressing state of affairs in Tharparkar. Defending his government’s report card, Sindh Chief Minister Syed Qaim Ali Shah this week claimed in a speech in the provincial assembly that his administration has recently arranged wheat worth Rs2 billion for the drought-hit areas of Tharparkar. Ironically, he denied anyone had died of hunger over the past five years, and also contradicted reports of an unusual increase in child deaths in Tharparkar. Unofficially, more than 100 drought-affected children reportedly died in the region this year – 32 in the month of February alone. Officials say they are giving 50 kg of wheat, free of cost, to every family. But local NGO’s insist very few families ever received the entire 50kg allotted to them. With the government insisting all problems will be solved with a 50kg bag of flour, the future looks bleak for the people of this neglected part of Pakistan. • 40 is the number of cases of suicide in Tharparkar district in the first ten months of 2014. • A tehsil-wise ratio of suicides shows that 42% of the cases were in Mithi, 23% were in Nagarparkar, 20% in Chachro and 12% in Islamkot. • 50% of the cases were men and 50% were women and children. Published in The Express Tribune, October 29th, 2014. Posted in Health, Human Rights, Pakistan, Women and tagged AWARE Tharparkar, drought Tharparkar, poverty, suicide, Tharparkar. Bookmark the permalink.